The memorial of Our Lady of Altagracia is celebrated on January 21st. 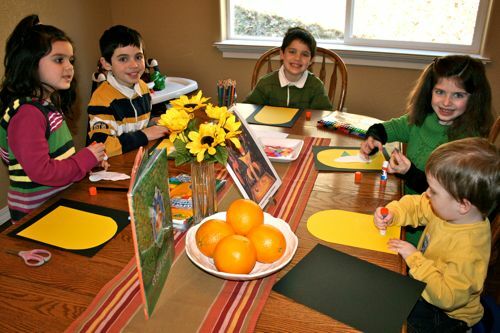 My children have really enjoyed celebrating this feast day in past years, ever since being introduced to it through Catholic Mosaic and the beautiful picture book A Gift of Gracias: The Legend of Altagracia . Since we have a very busy day tomorrow, we made a couple crafts and had a "tea" in honor of Our Lady this afternoon after we finished up our school work for today. In Alice's lovely Tea in Honor of Our Lady of Altagracia she suggests creating delicate paper hands, to represent the loving hands of Our Lady, at the beginning of the tea. 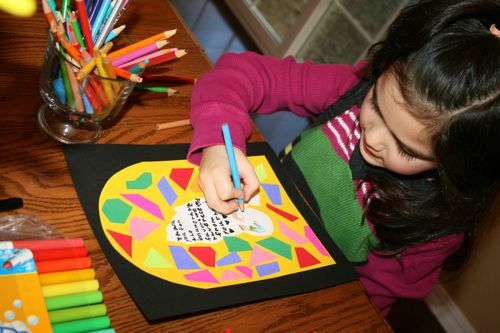 Here is how we created "Our Mother's Hands" adapted from Alice's suggestions and a craft I ran across at Danielle's Place. 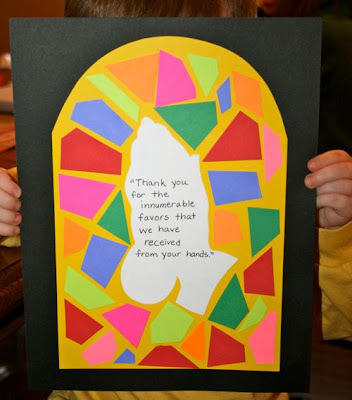 Using the patterns cut the window shape from the yellow paper and the praying hands shape from the white paper. 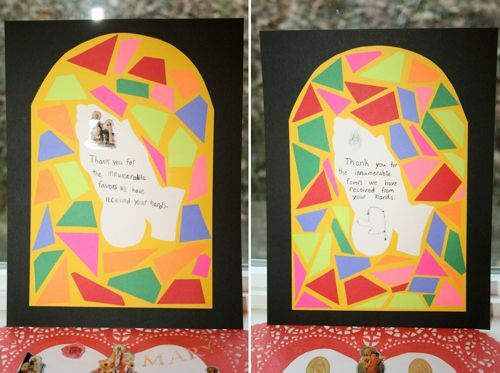 Cut up scrap pieces of paper (neon colors work best) into small one inch shapes. 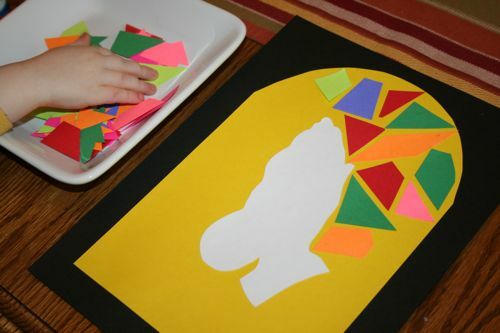 Have the children glue the window shape to a piece of black (or dark blue paper) and then glue the white praying hands to the center of the window. 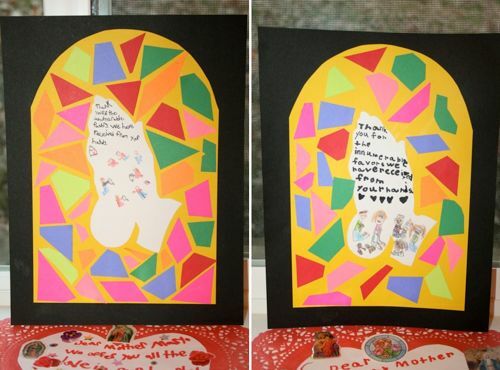 Next, have the children glue the small pieces colored paper to the window shape, creating the "stained glass window." NOTE: This craft can be easily adapted by writing the Our Father, or a variety of other prayers for other feast days, on the praying hands! love it. did you use your new cutting machine? i may put one of those on my gift wish list one day. Thanks Robina! 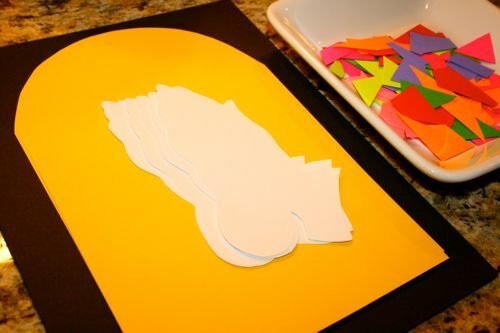 And, no, we just used scissors, but it didn't take very long to cut out the paper we needed for this craft.